While you are out into the wild, having a good survival knife not only comes in handy but also increases your chances of survival. In fact, many wilderness survivalists like Joe Teti on Dual Survivals aired on the National Geographic Channel, have asserted the importance of survival knives. The MOVA-58 has proved to be the best addition to any wilderness lover’s survival kit; from splitting wood and making a fire in the wild to food prepping and self-defense, this knife can prove to be the ultimate survival tool. Although you have to pay a hefty price for the MOVA-58 but hey, when you are out into the wild, you better bring along your best weapon! Moreover, the knife comes with a full leather sheath to make it comfortable for carrying, a fire steel to start a fire and a sharpening stone to keep that blade top notch. The MOVA-58 boasts a Spanish-made, laser-cut, stainless steel blade. The blade itself is 4.75 inches thick and 5.70 inches long which adds to the overall 10.82 inches of the knife and is just enough to make the knife portable and comfortable to carry around. The blade has a sharp edge making it ideal for a range of activities such as batoning, splitting, chopping and cutting. The MOVA-58 is a full-tang knife which means the blade is one solid piece of silverware, making it very durable and rigid. The blade is made out of stainless steel-Molybdenum-Vanadium 58. Known for its strength, durability and it’s resistance against extreme temperatures and moisture, the Micarta handle forms a perfect marriage with the stainless steel blade. The two handle pieces with Kydex grips, pinned on to the blade, give it the perfect grip on the hand allowing you to cut through the most rigid materials without leaving a single scratch on your hands. As it can bear extreme temperatures, you can use it in the most freezing conditions as well as in the most humid ones without fear of it getting brittle in the long run. 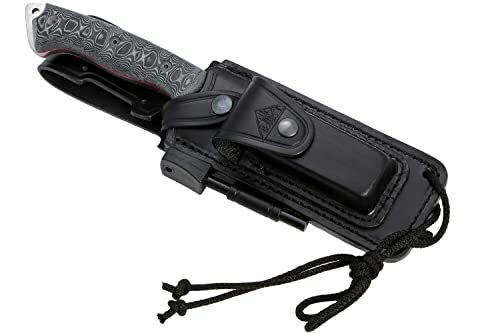 The full leather sheath comes with a blade sharpener and a fire steel creating an all in one package for the wilderness lovers out there; the fire steel can be used along with the knife to create sparks almost instantly, needed for your campfire while the sharpener leaves the blade with a thin and sharp edge. The sheath can also be made water-proof by using bee wax on it, so you do not have to worry about it getting soaked. Not only that, the sheath itself is quite sleek and can easily be attached to a belt or your bag, making it very easy to carry. 1. Do the knife and the sheath come in different sizes? Yes, the MOVA-58 comes in three different colors: Celtiboro Black, Celtiboro Coco and Olive Micarta. However, the prices vary for each color. 2. Is the price all inclusive with the sheath, fire steel and sharpener? Yes, the sheath, fire steel, and sharpener come with the knife. 3. Can I use this to hunt ligers? Yes, it’s certified for Ligers and pigeons. 4. Does the blade have a sharp 90° spine? All in all, this product is a great value for money because of the care and quality with which it was manufactured. Also, don’t forget that the knife comes in three sleek colors: Celtiboro Black, Celtiboro Coco and Olive Micarta, hoping to meet the taste of a wider range of customers. If you are a knife enthusiast and are keen to possess one which will set you apart from the others, then this is a must buy. With its unbeatable features, the MOVA-58 has stood out in the ever-growing market of survival knives and has established its position as a very popular choice for all the camp lovers, hunters and wilderness enthusiasts out there.